The government’s Depart of Digital, Culture, Media and Sport (DCMS) has gifted the Shetland Islands Council £1.91 million to boost and extend its broadband network across to Yell and Unst. 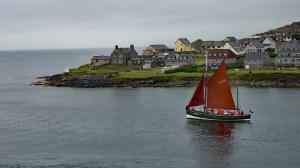 Although the route is still being finalised, it is anticipated that the connection will extend the present network from Graven to Mossbank and Toft, to Yell and Unst, and even to Fetlar in the future. Forging the gigabit fibre network comes as part of the Scottish government’s Reaching 100 per cent (R100) Programme, available to successful bidders for a slice of the Scottish government’s £600 million procurement. The initiative aims to develop a core infrastructure of reliable and superfast broadband connectivity in public premises. By extension, this will aid private businesses and homes to access such internet speeds through the connectivity “hubs”. The Council received the investment through the Local Full Fibre Network Challenge Fund, which will allow it to cater to public premises like schools, care centres, and health clinics as part of the NHS Shetland. It is likely that the stronger internet speeds will also boost video-working, such as telemedicine and online learning. Chair of the Council’s Development Committee, Alastair Cooper, said: “This is good news for the North Isles, who have historically suffered from poor broadband and connectivity, while other parts of Shetland have seen upgrades. The Minister for Digital, Margot James, commented: “We’re building a Britain that’s fit for the future, and our plans for a national full fibre broadband network underpin our modern Industrial Strategy.